How did we get to where we are? 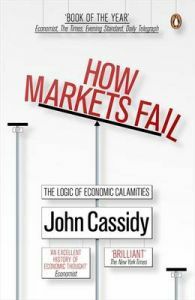 John Cassidy shows that the roots of our most recent financial failure lie not with individuals, but with an idea - the idea that markets are inherently rational. He gives us the big picture behind the financial headlines, tracing the rise and fall of free market ideology from Adam Smith to Milton Friedman and Alan Greenspan. Full of wit, sense and, above all, a deeper understanding, "How Markets Fail" argues for the end of 'utopian' economics, and the beginning of a pragmatic, reality-based way of thinking. John Cassidy has covered economics and finance at The New Yorker magazine since 1995, writing on topics ranging from Alan Greenspan to the Iraqi oil industry and English journalism. He is also now a Contributing Editor at Portfolio where he writes the monthly Economics column. Two of his articles have been nominated for National Magazine Awards: an essay on Karl Marx, which appeared in October, 1997, and an account of the death of the British weapons scientist David Kelly, which was published in December, 2003. He has previously written for Sunday Times in as well as the New York Post, where he edited the Business section and then served as the deputy editor. In 2002, Cassidy published his first book, Dot.Con. He lives in New York. by D. Sambandhan et al.